Over the last 10 years there’s been a monumental shift in the TV landscape – audiences are firmly in the driving seat, with full control over what they watch and when they watch it. It’s no surprise, then, that viewing behaviors have changed; young people in particular are consuming TV in much more diverse ways than previous generations. Thinkbox, who suggest that TV still accounts for 65% of 16-24’s overall video consumption. 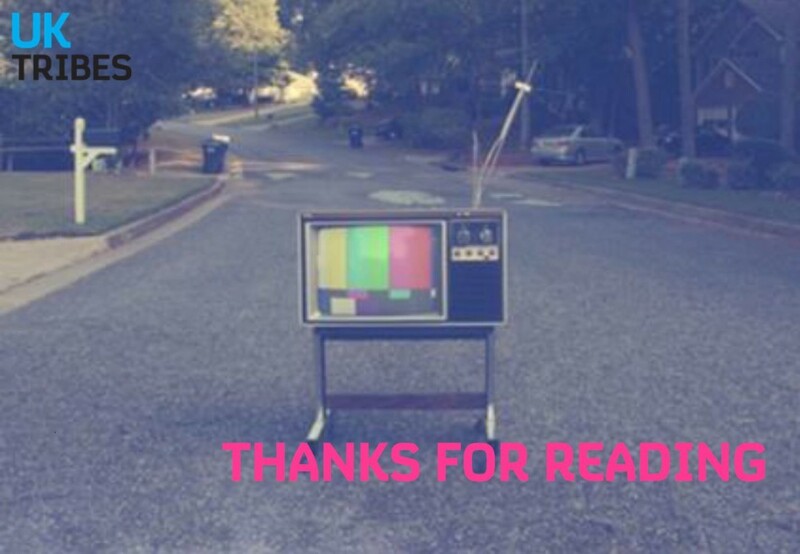 Contrary to popular beliefs, what has shifted is not the extent to which young people watch TV, but instead, how they are interacting with this much loved activity and how video has proliferated into more aspects of their lives. Thanks to advancements in broadcaster on demand services, developments in PVR offerings, streaming and popular OTT platforms such as Netflix, TV viewing is now increasingly on Tribes’ terms. For older Tribes the days of rushing back from school to catch Grange Hill is a distant memory. The youngest Tribes have pretty much grown up with these advancements and are fully accustomed to being able to schedule TV around their lives rather than vice versa. 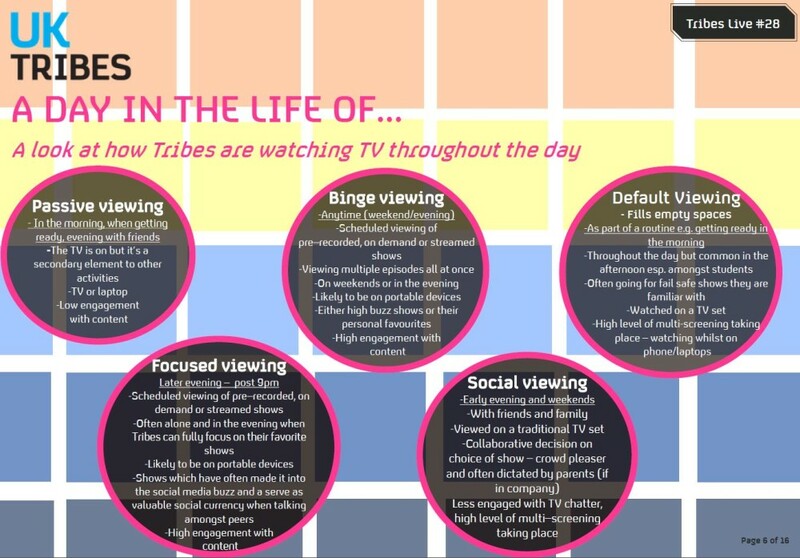 Better yet, the options of what to watch are endless and can be found at the press of a button or tap of a keyboard; Tribes have an unlimited number of shows to select from and a pick ‘n’ mix mentality has become the norm when it comes to show selection. 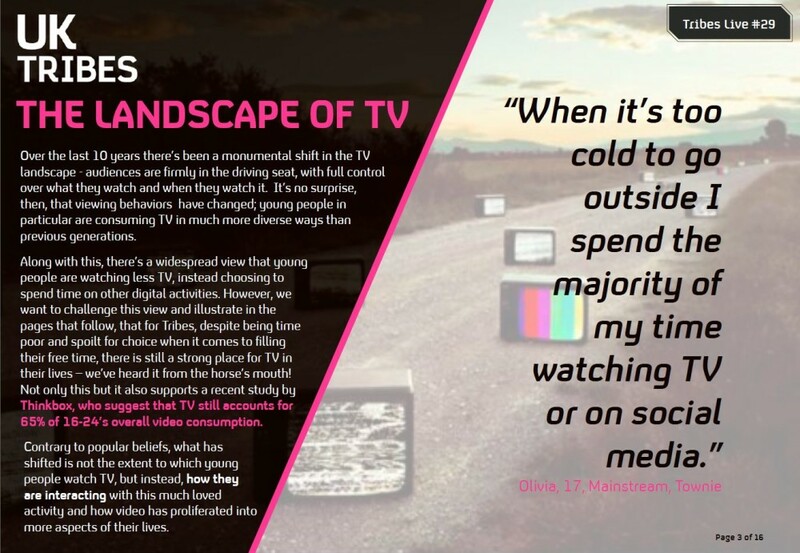 The ability to watch TV outside of the constraints of live TV is a welcome innovation for time poor Tribes, who form a key demographic of the ‘I want it now generation’. This is a growing consumer segment that demands complete control over the brands and content they consume. Not only are Tribes in complete control when it comes to what and when they watch, they are also becoming increasingly accustomed to having everything all at once; patience is no longer a virtue required when it comes to TV viewing. Whilst not required however, it seems patience is a virtue that young people are still keen to exercise when it comes to TV. Thinkbox found that 73% 18-24year olds prefer the slow reveal over the quick and dirty binge watch when given the choice between downloading an entire series to watch in one go or watching one episode week by week on live TV. It would appear that the social currency and excitement of being part of the chatter and buzz of a new series may actually win-out over the “I want it now generation”. While the TV landscape has diversified significantly, TV is very much a medium that’s here to stay. 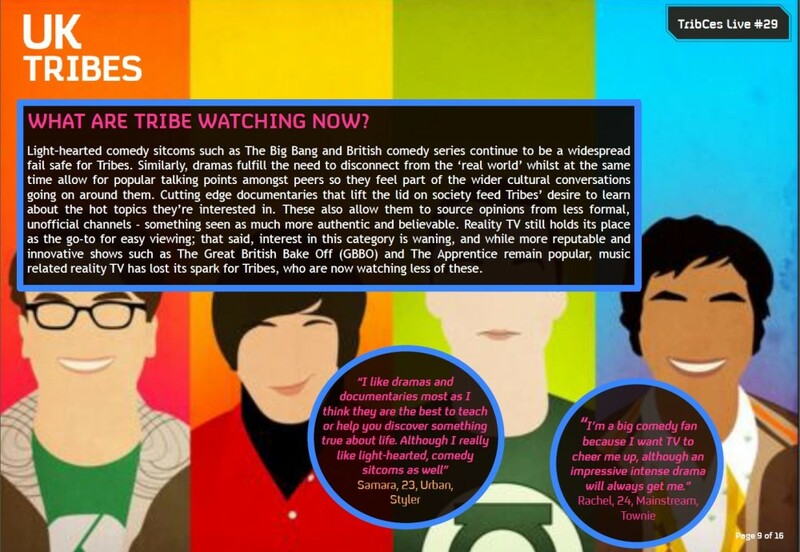 Despite claiming to have limited free time due to other responsibilities such as school and work, and having an increasingly diverse range of activities to keep them busy when they do catch a break, Tribes are staying loyal to TV. Most turn to this form of entertainment as a welcome relief from their daily grind, watching in the comfort of their homes. What is clear, however, and reflective of modern day living, is that their attention is in high demand and multi-tasking with a number of other screens at the same time has become common behaviour. While this may initially seem like a negative, in reality it is quite the opposite. It means that young people are open to multi-platform interaction with content and brands, increasing the access points for advertisers. Young people may look up products or celebrities they see on TV or jump onto Twitter to check out what others are saying about the shows they’re watching. Consequently, they’re helping to drive the buzz around the show, which in turn increases the likelihood they’ll go back for more. Other potential benefits of having another screen to hand could be that young people are more likely to actually stay in front of the TV when the ad-breaks are on. Furthermore, the proliferation of iPads and smartphones may mean that young people are able to share more time with family; watching a program you’re not fully into becomes a lot easier when you have your phone to hand to occupy you when things get dull! 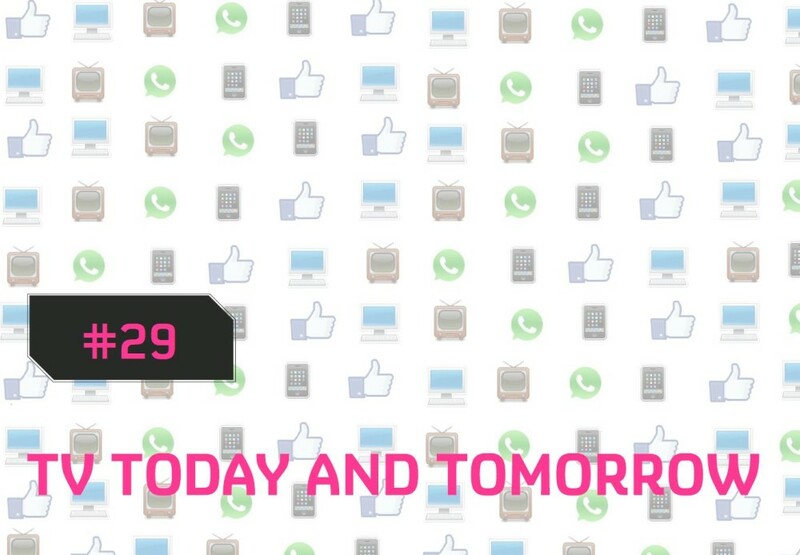 Which takes us onto our next question: is TV still a social activity? With an increase in portable devices leading to a slight move away from the traditional sense of ‘social viewing’ e.g. all being gathered around the TV set, one could be forgiven for thinking that TV has become a ‘me’ activity – an act for the individual rather than a group. 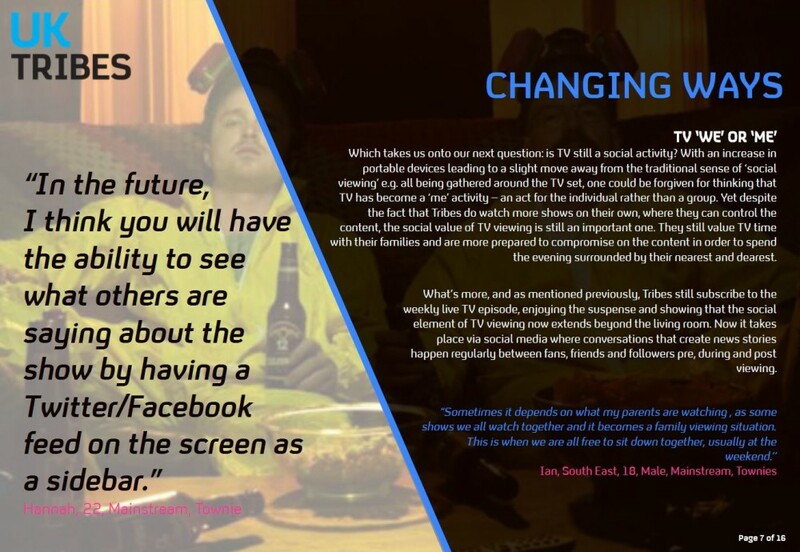 Yet despite the fact that Tribes do watch more shows on their own, where they can control the content, the social value of TV viewing is still an important one. They still value TV time with their families and are more prepared to compromise on the content in order to spend the evening surrounded by their nearest and dearest. What’s more, and as mentioned previously, Tribes still subscribe to the weekly live TV episode, enjoying the suspense and showing that the social element of TV viewing now extends beyond the living room. Now it takes place via social media where conversations that create news stories happen regularly between fans, friends and followers pre, during and post viewing. 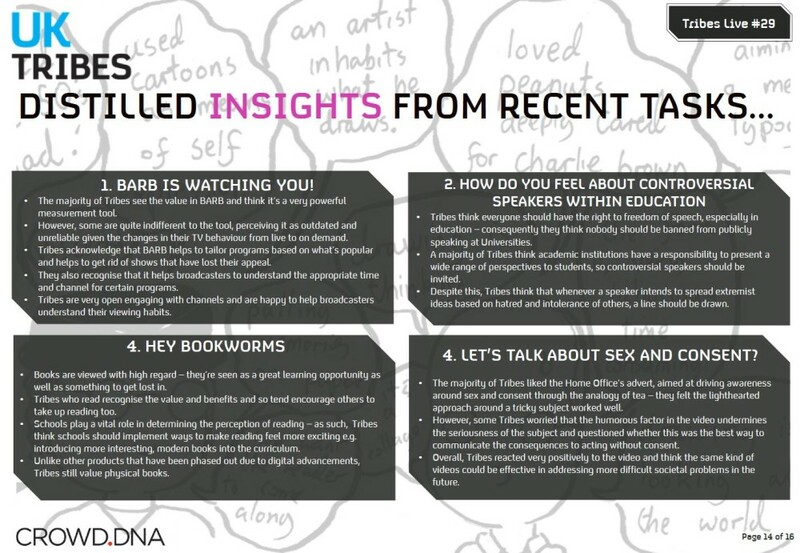 And it’s not just behaviours around how, when and with whom Tribes are viewing TV that are evolving. Audiences are now able to handpick from a vast range of shows available at any time of the day. The result? Tribes are becoming more demanding about the TV they consume. They expect a certain level of quality and content that grabs them emotionally if they are to give half an hour or more of their day to a show. Consequently, shows that may have previously made it onto their watch list by default are now going down in their estimations and, in many cases, dropping off the list completely. Take for example music shows such as MTV and Viva. These are generally now skipped over by Tribes or only put on in the background, largely due to the lack of interesting, engaging and quality content, that is felt to offer nothing over and above what they can find on YouTube. WHAT ARE TRIBE WATCHING NOW? Light–hearted comedy sitcoms such as The Big Bang and British comedy series continue to be a widespread fail safe for Tribes. Similarly, dramas fulfill the need to disconnect from the ‘real world’ whilst at the same time allow for popular talking points amongst peers so they feel part of the wider cultural conversations going on around them. Cutting edge documentaries that lift the lid on society feed Tribes’ desire to learn about the hot topics they’re interested in. These also allow them to source opinions from less formal, unofficial channels – something seen as much more authentic and believable. Reality TV still holds its place as the go-to for easy viewing; that said, interest in this category is waning, and while more reputable and innovative shows such as The Great British Bake Off (GBBO) and The Apprentice remain popular, music related reality TV has lost its spark for Tribes, who are now watching less of these. With so much content available, there is added pressure to choose wisely. 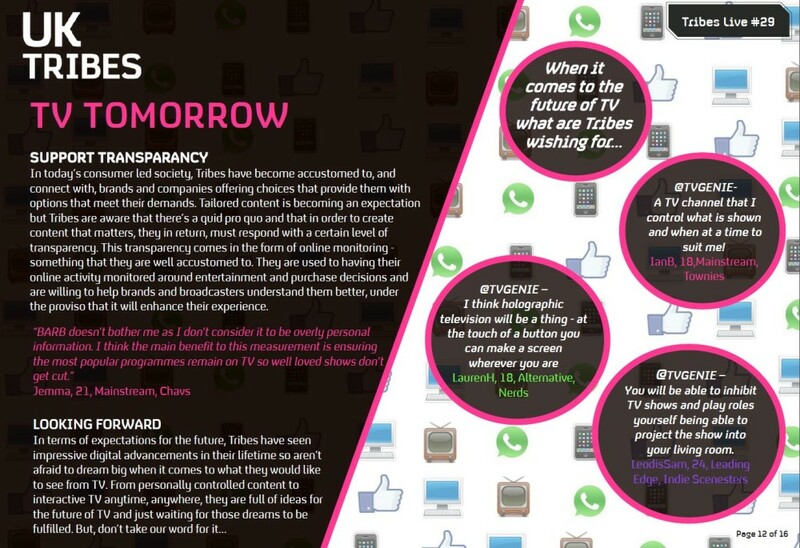 Tribes don’t want to spend time on something that is not worthwhile, however when it comes to TV there is no ‘try before you buy’ option, so instead, Tribes default to fail safes that they know and love or digital word of mouth and peer recommendations. 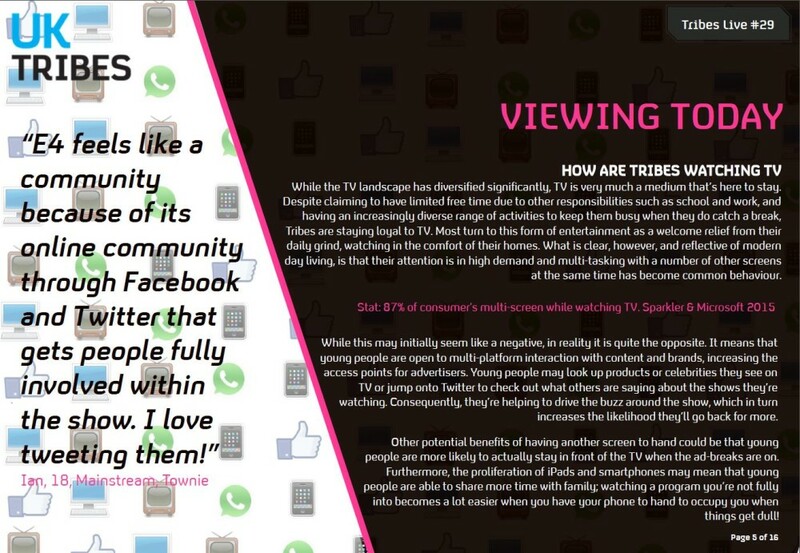 These latter sources play the biggest role by far in creating awareness and driving Tribes to watch shows. What’s more, they allow them to become part of the TV chatter which is still an extremely valued source of social cache amongst peers. 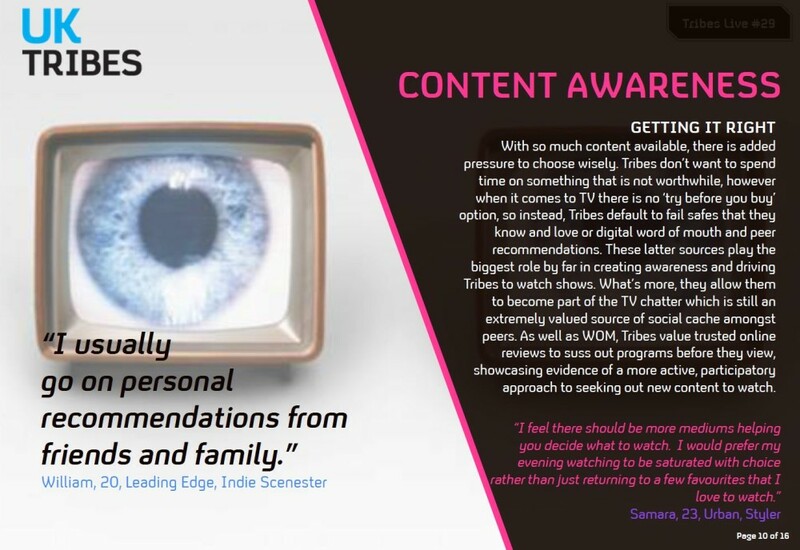 As well as WOM, Tribes value trusted online reviews to suss out programs before they view, showcasing evidence of a more active, participatory approach to seeking out new content to watch. In today’s consumer led society, Tribes have become accustomed to, and connect with, brands and companies offering choices that provide them with options that meet their demands. 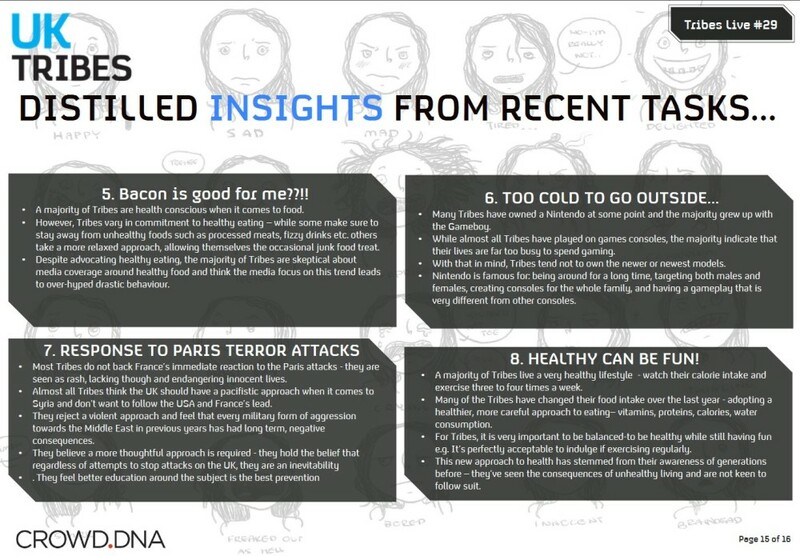 Tailored content is becoming an expectation but Tribes are aware that there’s a quid pro quo and that in order to create content that matters, they in return, must respond with a certain level of transparency. This transparency comes in the form of online monitoring – something that they are well accustomed to. They are used to having their online activity monitored around entertainment and purchase decisions and are willing to help brands and broadcasters understand them better, under the proviso that it will enhance their experience. @TVGENIE– A TV channel that I control what is shown and when at a time to suit me! 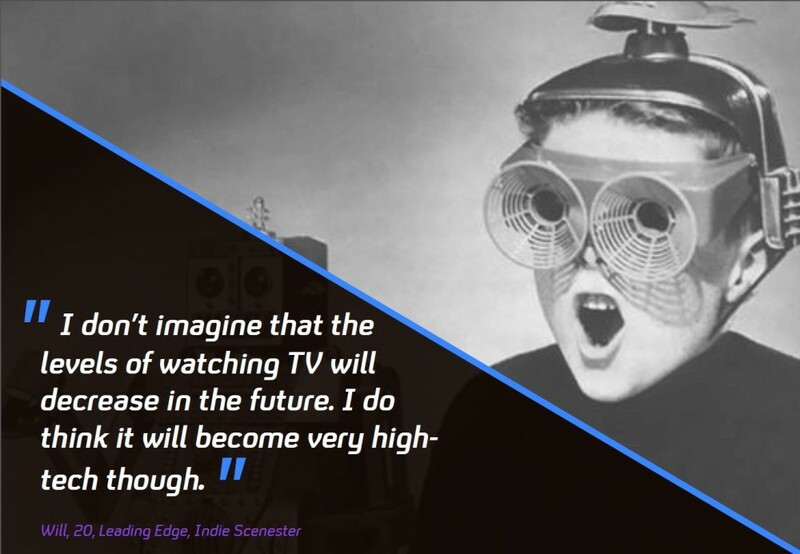 @TVGENIE –You will be able to inhibit TV shows and play roles yourself being able to project the show into your living room.